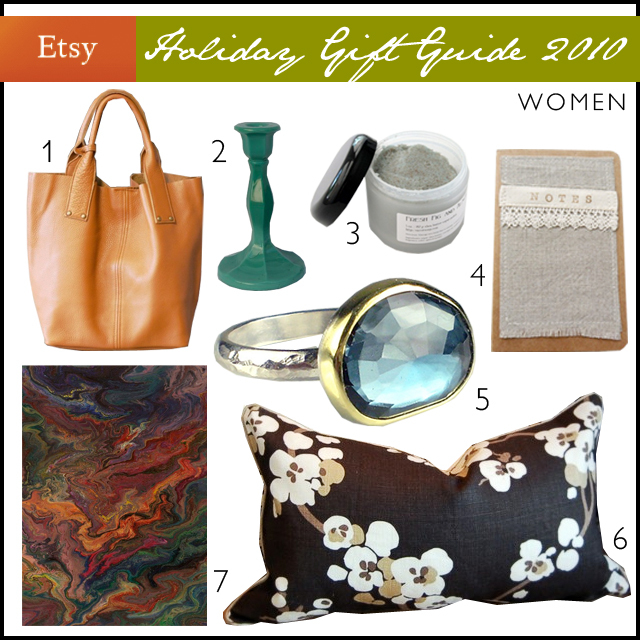 I decided to do a little Holiday gift guide series this year featuring all things from Etsy.com. You all know how much I love Etsy - I'm all about supporting artists and handmade. It's also nice knowing you're giving something truly one of a kind! This bag is beautiful and a fraction of the price of a designer bag. The style and color are classic, I'm sure any women would love to get this! I was so blown away by this color. They are a bit pricey for candlesticks, but so unique and beautiful. You could design an entire table around them. A great stocking stuffer or hostess gift. Just reading the description makes me want to take a bath. You can even use it on your face! This ring is STUNNING. Not much more to say about that! I adore the pattern on this pillow. And the down insert is included! I'm sure you know my favorite part... the matching piping! This painting is so beautiful. It's small (5x7) but packs a big punch. At first it looks like a piece of marble paper, but as you get closer you'll see it's hand painted. A perfect piece of original art on a budget. Tomorrow I'll be posting an Etsy gift guide for men and one for children/babies on Weds! Those candlesticks are fabulous, what a gorgeous, rich color! I'm in love with the magic carpet painting. Gorgeous color! I want the bag and the art, for sure. Or everything on the list. Whatever. Oooh, I love that Magic Carpet painting!! Such great picks! I want that bag and pillow for myself! Love the pillow and ring! The bag and pillow are probably my 2 favs on that list. I'm loving it all. Thanks for the ideas. I think I may need to pick up that Romo pillow. That's a pretty great price for a Romo pillow with a down insert (and I love me some Romo!. I could have an unhealthy love affair with those candlesticks. I just may need to try to make my own version now.....Goodwill here I come!